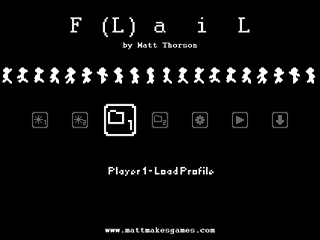 Released in March, 2008 by Matt Thorson, FLaiL is a surprisingly difficult platforming game with some very impressive art assets and a hugely addictive 'throw yourself in a direction midair' mechanic that will test your dexterity and skill like very few games ever did. Note: Runs are timed using the score, because it counts down like a timer. The 100% category for FLaiL has been defined as follows: maximum score per level (as many points items as possible), which is – as one of the verifiers said – the only reasonable way to run the game. The real, bloody way. If you want to give the game a try before watching the run (and I advise you to do so, at least to get an idea of how "slippery" the controls are), you can download it freely on his official website: http://www.mattmakesgames.com. If you like wall jumps in games in general, I promise you will not like them anymore! This new submission is a global and vast improvement. The execution is much tighter than before and includes many new strategies. The five last levels (8-6 to 8-10) are now recorded smoothly at 60 FPS instead of 30, like all the others. Everything is not "perfect", but I played each level multiple times until getting what I could call, based on my own standards, a near-perfect result. All is about paths optimization and reduction of delays. Big thanks to Cagar. He pointed out that I hadn't use the fly power where, like in 2-9, it can be activated and immediately aborted to save time, and convinced me to play the game once more. He also gave me better strategies for levels 3-5, 4-3, 5-3, 6-6, 8-1, 8-2. Then I looked at this leaderboard: http://timetrial.dabomstew.com/index.php and improved some levels after seeing the score of other players. Levels concerned: 4-7, 5-9, 5-10, 7-1, 8-6, 8-8. Once you know that a better route exists for a given level, it's only a matter of time before you figure it out. * Double tap: the action of pressing the jump key twice as fast as possible. It's hard to have a delay below 7-8 frames. * Quick tap: holding down the fly key for the shortest possible duration. Used for jumps with minimal height, to abort flights and to reverse moving direction. It's hard to go below 4 frames. The speedrun is recorded at 60 FPS, so 1 frame = ~0,017 seconds. In the game, the score/timer is decreased by 10 every 10 frames (~0,167 seconds). The game doesn't keep track of this degree of precision, but I do. To keep it clear and simple, I simply add a value to the fourth digit of my scores (listed below) which replaces the regular zero. One point means one frame. Thus, considering a visible score of 4000, a value of 4009 will be much better than 4000 or 4001. In other words, with this notation, scores are ten times more accurate. 1-2: oh Lord, look at those chasms! I almost died! 1-5: oh Lord, look at those spikes! I almost died again! 1-7: so it was actually possible to get 1260. One must manage a double tap and a quick tap at once. There is a margin of error of ~3 frames. Extremely hard, at least with a standard mechanical keyboard (if you are curious about it, I'm using a Logitech Internet Navigator Y-BE22, which is by the way a really poor product with severe ghosting issues). 2-7: very hard to not touch the second block and maintain the speed. 3-1: this is probably a perfect time. If not, I guess no more than 1 frame can be hunted down here. 3-8: time gained by aborting the boost. It is even possible to do a horizontal flight and grasp the edge of the platform where the springs are (I was only able to do it once, though). 3-10: the very start of the level is extremely hard to manage, but mandatory to get 2520+. 4-7: with enough velocity, it's possible to not stick to the edge of a platform. 4-9: one of the levels which makes me want to break my keyboard with a warhammer because of its terrible internal memory. 5-2: note that it's impossible to jump while crouched. 5-4: perfect accuracy is obviously required here... I'm proud of this one and wonder if the author has made the shortcut possible deliberately (I assume he has). 5-5: a pleasure to watch and a very technical level, although once you get the automatisms, it becomes pretty easy like most of the others. 7-5: it's possible to "skip" the second to last corner. Another time, perhaps! 8-9: clever, right? Probably the best time-saver of the whole run. 8-10: 4660 is easy, 4670 is hard, 4680 requires a perfect execution. Passing through the small gap at the top right corner is impossible. Thanks for watching the run, I hope you enjoyed it! All is now well optimized; there won't be another wave of improvements. Perhaps a 10 points improvement here and there, because there will always be a few frames to hunt down in levels involving a double tap, a quick tap or wall jumps. If you want to leave me your impressions or ask for any question, feel free to send me a PM or contact me at arcanod (at) gmx . com.